Did you know that a group of pug is called grumble? Yep, one of my pug knowledge. LOL. And, with that introduction, here's my grumble. 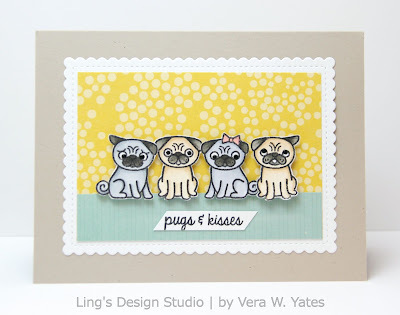 Peeps, I sure am having fun with this Sweet Stamp Shop Pug Life set. Needless to say, when Sweet Stamp Shop coming out with their pug set, I have at least 3 friends who tagged me. And, yep, I ordered the set within the first hour it's available in the store. I rarely ever say no to cute pug stuff. Hah! And, that cutie pug figurine is just one of the few pug collectible that I have. Haha... Not obsessed at all, right? When I finally could have my own dog, I always know I want to have a pug. I honestly don't remember of even seeing a real pug in person growing up, I just know I will have a pug. Before I got one, I bought a couple pug books & learned everything I could about it as I want to make sure I'd be a good pug mom. For me, dogs are for life, so I want to make sure I understand what it takes to have a pug. Ollie was my 1st pug. Followed by Milo, Eli and Clyde. They're my heart. Clyde is my foster failure. After being his foster mom for a month, I just couldn't give him up. Pugs are a full of characters. They're funny, spunky, bossy, yes often lots of work, and they shed like crazy. Most importantly they're full of love. Last but not least, today we're introducing Sweet Treats that's perfect for decorating your Halloween treats and for card making, of course. Here's my card using the set along with the previously release Coffee To Go dies. Be careful which drink you choose... You never know what it is! Would you like to win the Sweet Treats? Easy peasy, simply leave a comment on SPD Blog or for more chances leave comments on the DT blogs as well. You can find the complete list on HERE. Phew... we're almost there peeps! Welcome to day 4 of SugarPea Designs sweet peek. Just one more day before all the new goodies you've seen will be available for purchase! 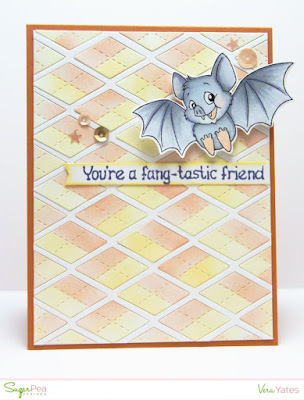 While waiting, let us introduce you to a cute li'l bat from the set Fang-tastic. The funny thing was when I first saw this harlequin dies, I was honestly just ho hum about it. I almost didn't use it on any of my card. But, goodness, once I decided to play with it, I was surprise at how much I like it. I like so much that I used it two days in a row (see my card from yesterday). The only bad thing... my hand is now hurting from coloring the inserts!! The sequins sprinkle I put on my card is from Warm Golden Glow Sparkly Shaker collection. Yep, in case you forget or didn't know, SugarPea carries beautiful sequins mix collection. Now, on to the giveaway. You could win this Fang-tastic set. Simply leave a comment on today's SPD Blog post and for more chance, on each of the DT blog. You can find the complete list on SPD blog. Hi peeps! 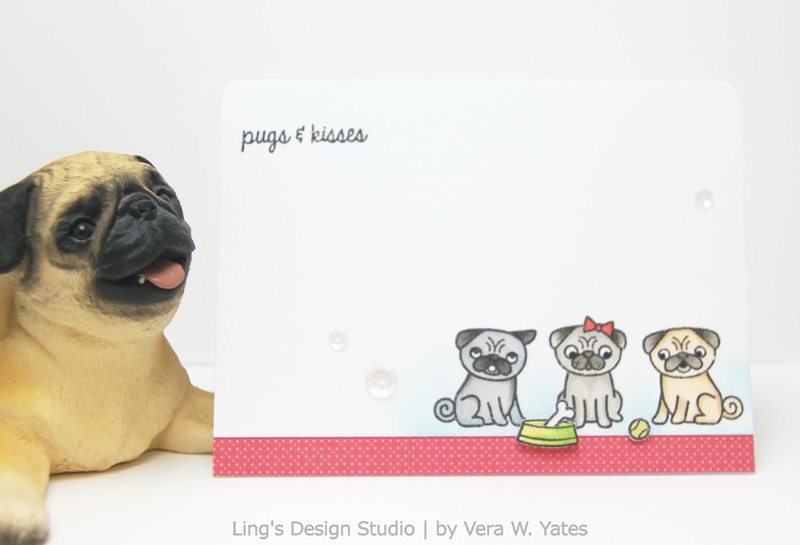 Welcome to day 3 of SugarPea Design sweet peek. I hope you've been enjoying the festivities. 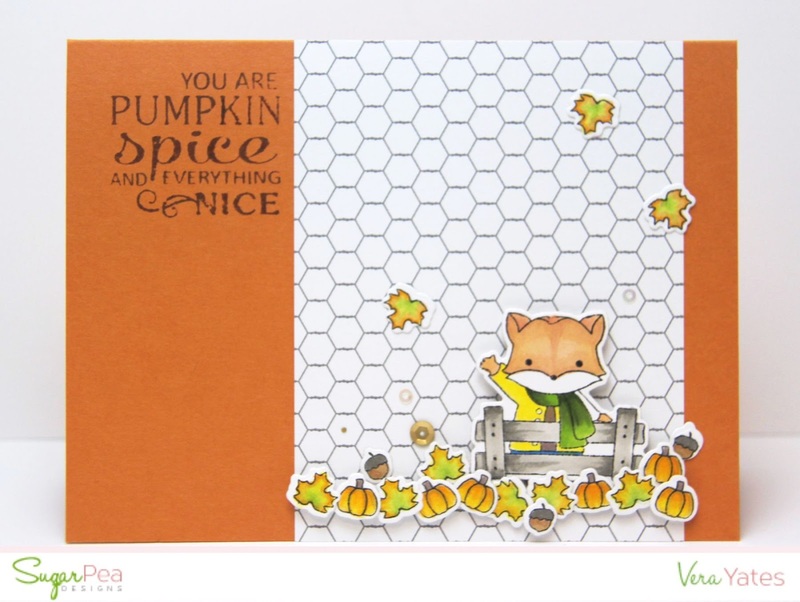 Today, we're introducing a super cute set by our newest designer, called Fall Fox. I have to say I am pretty impressed with myself for using this dark orange color. Hah! Very, very rare where I reach for this color. Now, I was going to go with just 1 card, but then I saw a card by my team mates Simonne Clay and I just love her card so much that I ended up making another card inspired by hers. Now, how would you like to win the Fall Fox stamp set? All you need to do is leave a comment on the SPD blog. It's THAT easy! You have all week to comment! Winners during our Fall Product Release will be announced on Sunday, August 28th. 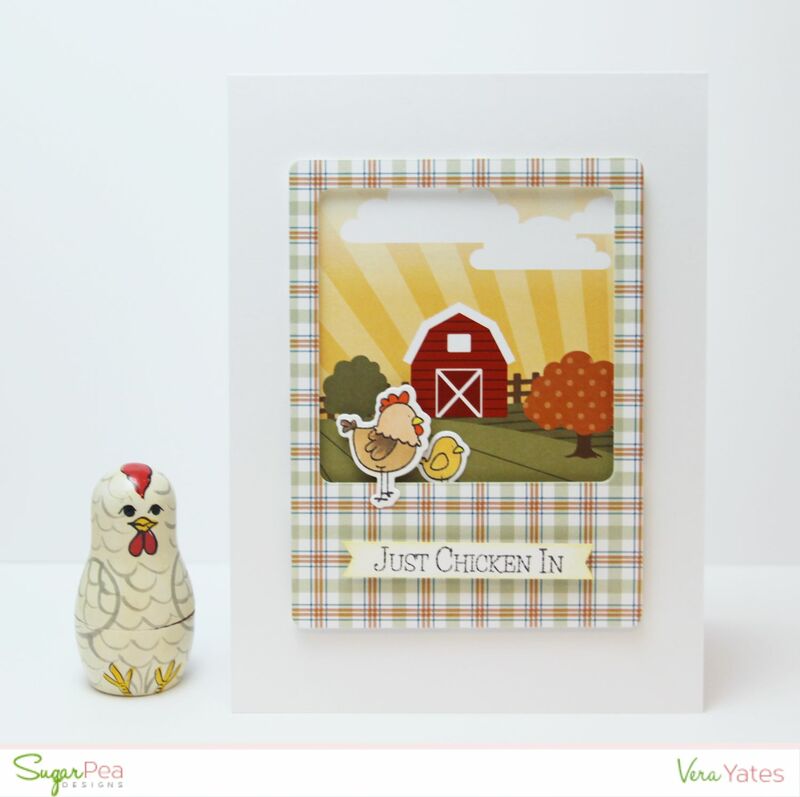 Welcome to day 2 of SugarPea Designs sweet peek! With fall just around the corner, I am sure you're expecting some fall related set, right? 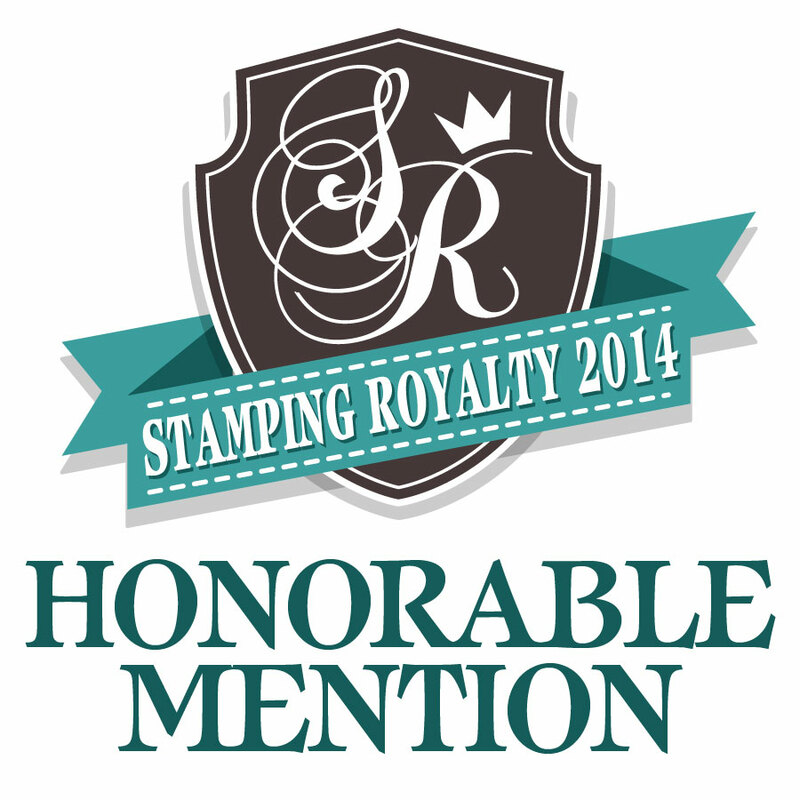 Well, for today, we're excited to show you Lovely Leaves stamp set along with its coordinating dies. Now. I have to admit that fall cards are my least favorite card to make, simply because I was struggling with the fall colors. I find them a bit depressing sometime. I know, I know, how could it be, right? What can I say, I love bright, happy colors. Anyhooo.... I was struggling when I was working on this card. I already stamped all the leaves and I just was not feeling it. Then, I start browsing Pinterest and saw some graphic design where they add blue/teal to the fall color combo. I was immediately, that's it!! That's what I need. 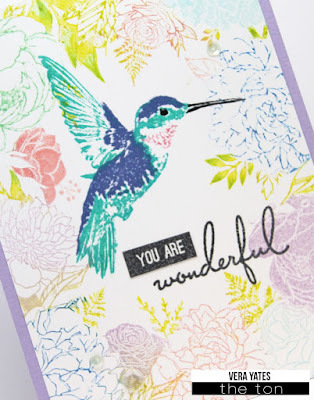 A pretty, light, blue color to liven up my card. Somehow that light color makes all the difference in my color world. And, I got even giddier when Wendy created one of the banner for this release using this card! The very card that I was struggling with! Would you like to win the Lovely Leaves stamp set? Easy peasy. All you need to do is leave a comment on the SPD blog.You have all week to comment! Winners during our Fall Product Release will be announced on Sunday, August 28th. 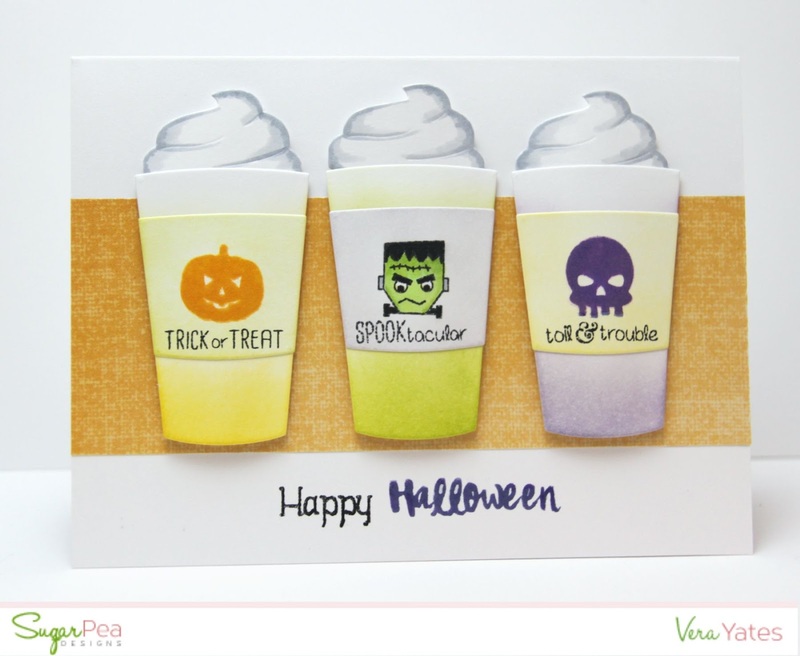 The sweet peas team has created some fun inspiration for you using the products we are introducing today. Visit each of their blogs and leave a sweet comment for them, giving you an extra entry to win today's giveaway prize. Visit the SPD blog for details and for a list of participating designers. Come back tomorrow for more fabulousness. Hi peeps! 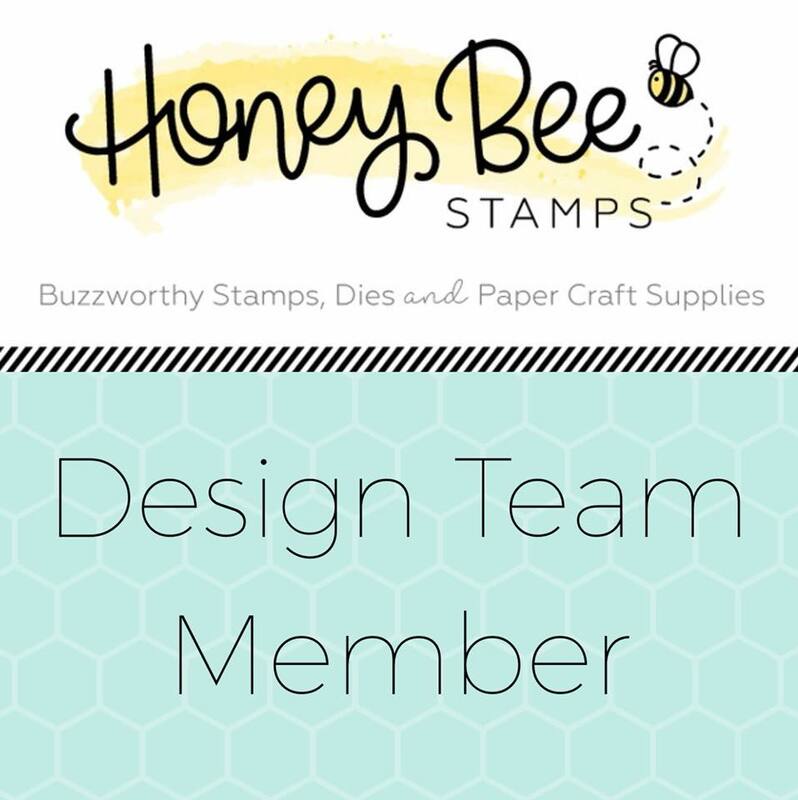 It's time for SugarPea Designs sneak peek! With fall just around the corner, we are excited to introduce you to our 2016 Fall Product Release. Please join us over the next 5 days as we share Sweet Peeks for the 12 NEW products that will be available for purchase starting this Friday, August 26th at 6PM ET in the SPD Store. And, as always, we have FIVE giveaways that you can enter! Without further delay, here's my 1st card for today. You know me, I love critters! I have so much fun playing with this set. And, the fab background with the barn, tractor and windmill is courtesy of the new, amazing FarmScape die. So fun to play with! 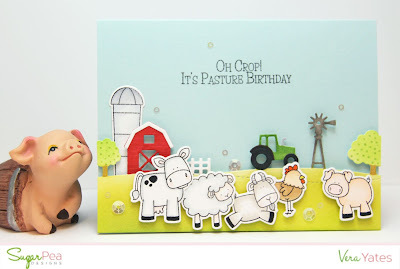 For my next card, I am using the patterned paper from the new Countryside Charm Collection. The chickens are from Best of Cluck, which you can receive for free when you place an order* of $60 or more (excluding discounts and shipping). Now, how would you like to win the Barn To Be Wild stamp set? All you need to do is leave a comment on the SPD blog. It's THAT easy! You have all week to comment! Winners during our Fall Product Release will be announced on Sunday, August 28th. Hi peeps. How's thing going? It's been super quiet here isn't it. Sorry, I just been mojoless lately and just hasn't been creating a whole lot. However on the bright side, I've been slowly cleaning out and sorting out stuff around the house. Every now & then, I just go through a period, where I just feel the need to go inward. Where I don't really want to create and just in really weird mood. Not necessarily bad mood, just weird. Can't quite explain it. So, when that happened, I usually like to take my time go through my closet, the pantry or piles of papers, magazine that been waiting to be organized. The act of sorting and throwing out stuff seems to help clear the clutter in my head as well. Also, we plan to move to Houston spring next year, and I don't want to move stuff that I won't use or no longer bring joy for me. 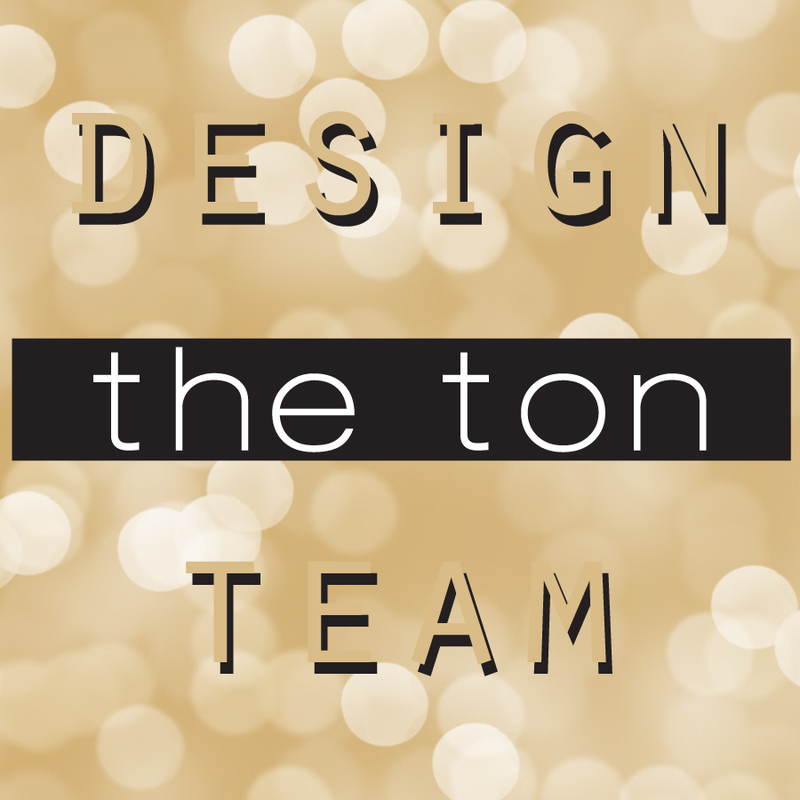 Anyhoooo..... as far as card stuff, I am up on The Ton Blog today and sharing this fun project. Check it out, will you.